If we will say, call center and contact center are now the largest and fastest growing industry to provide the services to their clients, it wouldn’t be inevitable to hear because they are facility provider to different industries and companies around the world to perform various task like telecommunication, customers support centers, sale, and purchase services center and also for conducting survey and many more. In the call center, they face many problems like bad calling services, call drop out, sometimes the dialer will not access to the caller ID, there are many callers who teased by regular calling but others dialer didn’t filter that callers, call center managers or owners have some fears of losing call records. Call center agent facing problems to dial the numbers manually. These are some of the problems, a call center faced. But still using that old one dialler for their call center. Are they have not enough resources to get the newer setup? Or they are not aware of the solution to their problems? It’s not too late to know about Avatar Dialler. Avatar Dialler an auto dialer software which gives you the best quality of voice recordings with the perfect accent for your valuable customers and makes thousands of calls with prerecorded voices and performs your duties efficiently and with double of the speed. How Avatar Dialler Solving Your Problems? Feed up by Dialling Numbers Manually? Most of the time agent facing the problems of manual dialing in the call center, in case wastage of times and money as well. And also wait for, when the call picks and when drop out but through predictive dialler, the problem of manual dialing resolve by the software. But how its work? Predictive Dialler is a system in which software automatically dials customer calls and connect the call to agents when answered. With Predictive Dialling system, you no longer need to spend hours to make your customers’ calls as our predictive dialer will automatically dial as many calls as you want. You will fix a quota of your choice for predictive dialler in order to make marketing calls or campaigns and predictive dialer will automatically dial numbers according to the set quota and will transfer calls to you only when connected. So now you no longer need to go through unanswered calls and wait for a call to get connected, all you need would be to greet your customer and let predictive dialler handle the rest. Dialler that works with VoIP technology. So work efficiently and effectively and save your money and time with our Hosted Predictive dialler. Did you Aware by your Agent Status? As a call center owner or manager, they will face the problems, which agent is going to on-air call and which agents holding their calls, and whose agents dealing with how many customers or making the sale in a day. Facing a problem? The solution is all in one Avatar Dialler. That provides you a software named Agent Status Board. How does it work? Get the whole history of your agent working in the status board. Know which agents are with call hold, free or on call or how many calls they made or how many sales they achieved with a single glance at their status board. So just take a look at the chart and evaluate your agents! Have you lost your Call Records Ever? If your call center is facing the problem of losing your call records or have no idea, which one of your agents is talking rudely or good with customers? Don’t afraid of losing call records the solution is all in one Avatar Dialler’s feature is Recording portal. How are the works? 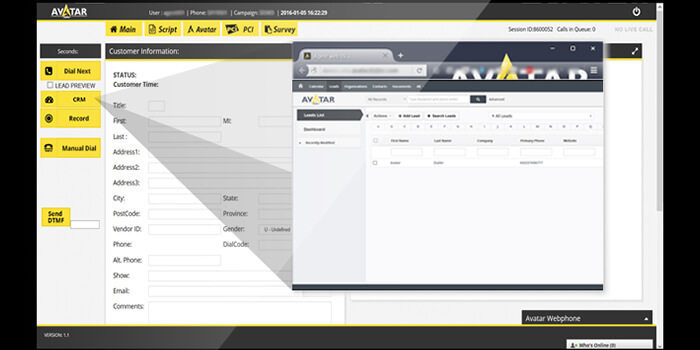 Avatar Dialler makes things easy for you as it understands all your needs and provides the best solution! Now you don’t need to manually record any of your calls as Avatar Dialler offers Recording Portal where calls are automatically recorded when connected to the customer. Avatar Dialler recording portal gives you 100% security of your recordings and guarantees you its backup at any time. So even if you have mistakenly deleted a specific recording or your system is not free to find a particular recording, you can find it on our server. We ensure that your data will always be secured and safe. Not only that, but you can also search your recordings within second by any method of your choice. Search your recordings with lead name, number or date! Did your Agent Dialed TPS Numbers ever? /Facing Mishap of Dialling TPS Number? If your call center agents are dialing TPS numbers that are not allowed to be called and be in the problem of legal action against your company. Don’t afraid about again dialing of TPS numbers, because the solution of your problem is Avatar Dialler’s TPS/DNC Filtering gadget. How does it work? Save yourself from any legal action taken against you with the help of TPS/DNC Filtering software offered by Avatar Dialler. So dial as many calls as you want without ever being worried to encounter any mishap of dialing a TPS number. Did your customers Annoyed by international callers? Customers, your agent had called, having fear of international calling and customers are not feeling comfortable in conversation. Then you just a need of Avatar Dialler, that display your number of the local resident. How does it work? As Avatar Dialler understand all your needs so it provides you the best solutions that you can ever get! Just like Local Caller ID display option where you can get a positive response from your valuable customers by showing that you are from their area. Your customer feels relaxed when they see a call coming from their area. With local caller ID option, you can let your customers feel in ease by showing them their local caller ID. Even if you are not physically located at a specific place, you can always show your office residency as in their area no matter where you reside! Do you know your Earning? Do you aware of your earnings? How much spend you on your customers? Avatar Dialler’s new gadget named Transparent Billing provide you just in seconds, know your balance on the go and be aware of your money and save your time. And not only that, Avatar Dialler offers you easy VoIP Billing which means that you can check your balance anywhere in the world. All you need is to connect to the internet connection and there you go! So always be aware of your balance with free VoIP billing software that also ensures you the security of the information that you need!